There are many ways to enjoy the Star Wars universe: movies, comic books, roleplaying games, video games, novels... lunchboxes. Despite the sheer mass of the source material, Lucasfilms and their numerous subsidiaries manage to keep things fairly cohesive. At the time I was in beta, I had no real idea how the Star Wars licensing worked. In fact, I still only grasp the basic concepts of it all. So I was quite delighted to learn that Star Wars Galaxies wasn't only going to use material from the classic trilogy, but also borrow from the so-called "Expanded Universe" as well. I came upon this happy realization while getting lost in the Lucky Despot. Many of the entertainers and musicians were using the Lucky Despot as their main stage. There were a few regulars in the "band" that I would spend hours hanging out with between adventures. It was amazing to see how they all progressed: with new songs, dances, and special effects. The entertainer system was not something stuck on; it was a fully realized and immersive game unto itself. It was something I knew I had to try someday. 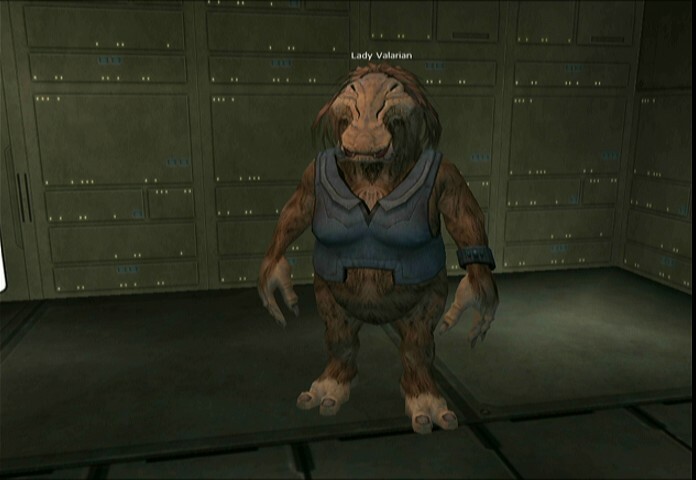 At any rate, I set off to exploring the Lucky Despot one day and was quite pleased to come upon the good Lady Valarian, pictured above. She didn't have much to say, as I recall. But there she was, providing me with a Star Wars geek out moment that I didn't know I had in me. I'd go on to find other "EU" personalities: Mara Jade, Crev Bombassa, Thracken-Sal Solo, and I recall being told that Thrawn was around somewhere. But as it was beta, he was standing around in his underwear. At least, I guess it was due to it being beta. Maybe his penchant for indecent exposure is why Palpatine eventually sent him into the outer reaches of the galaxy. Star Wars Galaxies grew much bigger that day in my mind. With full access to an already deep content pool, the potential for this game was staggering. Thank you for making me first realize this, Lady Valarian. My wife was rolling with her iMac; one of second generation models with a color called "graphite". Every beta invitee was allowed to invite a guest to play along. So that was all she needed to spec out an Alienware so she could play SWG. Heck, I was mothballing my Gateway for a souped up Dell so I could play, too. 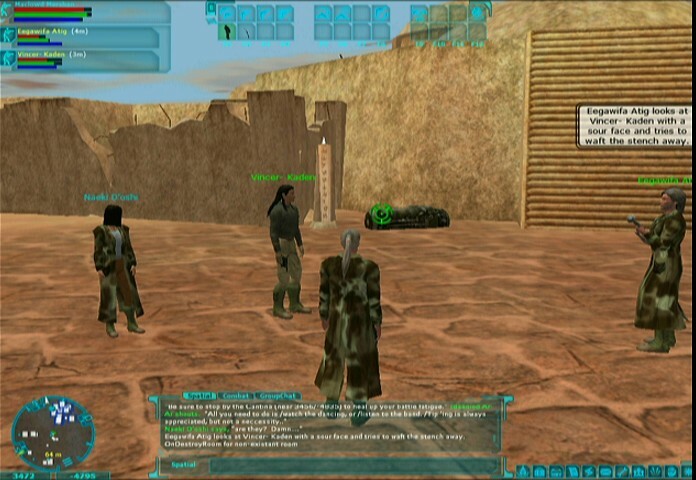 SWG was serious business, even in beta. And no expense would be spared. With great anticipation, our new rigs were delivered. In typical fashion, mine came weeks in advance. Sorry my dear! You can imagine how excited we were when we both could play together. She no longer had to stand over my shoulder and drool with envy as I explored the galaxy. And so was born Cyra Sedaris, or at least Seera Sedaris since the name was already taken. My wife used Cyra in our offline pen-and-paper game, just as I did Vincer. They were fully fleshed out characters, complete with backstory and personalities all their own. Pictured above is Cyra relaxing in a Med Center. By squinting my eyes at the text, I'm reminded that I was also dabbling in Medic at the time. So I guess I finally figured out just why my HAM bars were only half-colored! Live and learn. Or in this case, it was probably "die and learn". Healer, heal thyself. 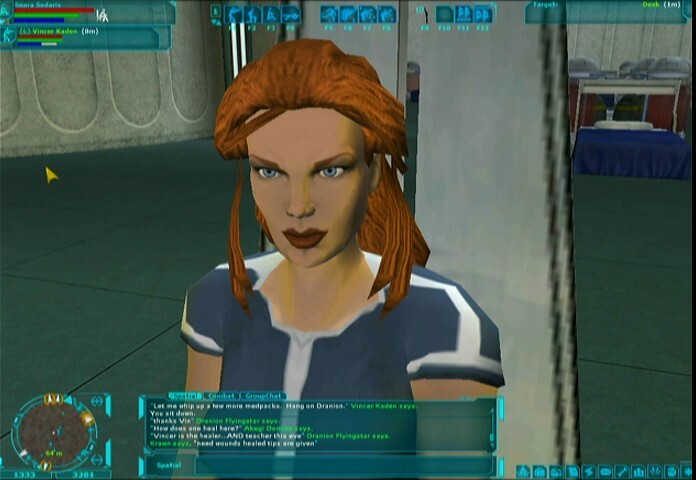 Cyra/Seera was always meant to be a Smuggler. But much as I had a very clear concept of what Vincer was supposed to be, the number of choices were too much to bear. We'd try just about everything we could. I think we both really liked Scout. But none of it really mattered. 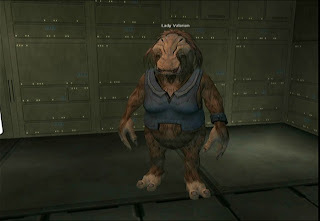 Vincer and Cyra (Or Vincer- and Seera, if you prefer) were together in Star Wars Galaxies. It almost felt like a dream come true. At the end of my first week in beta, the devs held a load stress test. 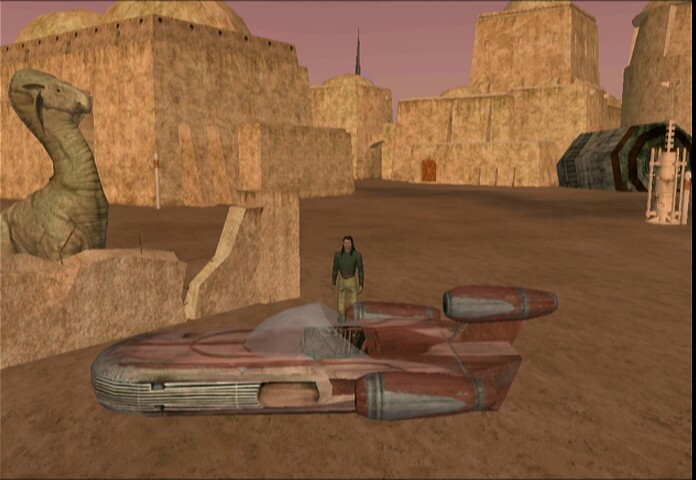 The MacGuffin was to be a terminal dropped somewhere in the game that would contain x number of credits. So we all loaded up, ready to strike it rich. As I recall, we were in Bestine, but it doesn't much matter for the story. We were many and we were eager, standing around in the worst possible attire, without any real clue as to what was going to happen. Suddenly, we were all off and running. There was a certain direction we were to head, though how or why anyone knew that is beyond my memory. Again, we were mostly new and very confused. I recall it being dark, and something that I would come to learn as "lag" was the order of the day. Within minutes, the crowd disappeared. And I mean that literally. Where there was once scores of players, there was just me and one other guy. So I elect for levity and type in "Everyone's lost but us." To my delight, the other guy not only laughs, but even gets the reference. (Did you?). He came running down the hill towards me, his toon yucking it up from just him putting in "lol". I don't think the stress test lasted much longer. I'm not even sure I know who won. I suppose someone did and that they spent all their winnings at the cloner insurance terminal. In the coming days, I came across this guy a few times. We'd adventure when we had the chance, share experiences; both our triumphs and our humiliating defeats. In the image below, you'll see why we had more of the latter then the former. We'd lose track of each other as beta grew and then the game went live. But fate did bring us back together after the game launched. (That's a tale for another time.) He'd later send me this screencap he took during beta. I remember this day in beta, meeting a "friend" of his who wasn't very good at games at the time, and wasn't comfortable typing. He used emotes from some shortcuts that were set up for him. Turns out that this was my buddy's father playing on a guest account that all us beta invitees received. What I laugh about in this picture is how wounded we all are. Check out the black on our health bars (actually Health, Action and Mind). We had no idea we were hurt, nor was there any doctor around at that point. We probably didn't even know where the hospitals were. It didn't much matter. 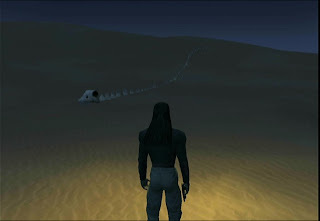 We were probably just minutes away from running out into the desert sands to be trounced by a bunch of angry womprats. But we did it with style and more then a few laughs and quotes from movies we loved. The father and son would go on to be a part of my guild and city in the coming months. But as I said, that is a story for another day. Bring Me Captain Solo and the Wookiee! Even without any global chat, the ripple of excitement made it's way across the beta server: Han and Chewie were in the Mos Eisley cantina! So I rushed there as fast as I could, ready for my first encounter with the characters from the movies and stories I love. One thing to note: all of the NPC bar patrons did not have their proper names yet. Ahhh... beta. There's something charming about a partially finished game; as long as it's free, of course! Han and Chewie weren't there the next day. I'd catch up with both of them on Lok months later after launch. I've got pics of that, too. All in due time as we continue this daily trip down the SWG Memory Lane. By my count, I've got about 170 more days to go. I'll run out of days before memories judging by the size of my screencap folder. 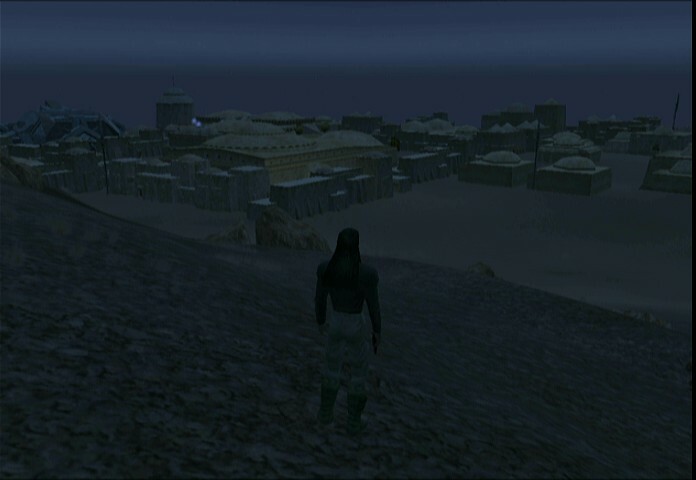 In the early days of SWG, one needed to stumble upon landmarks and points of interest instead of just looking them up in a datapad. 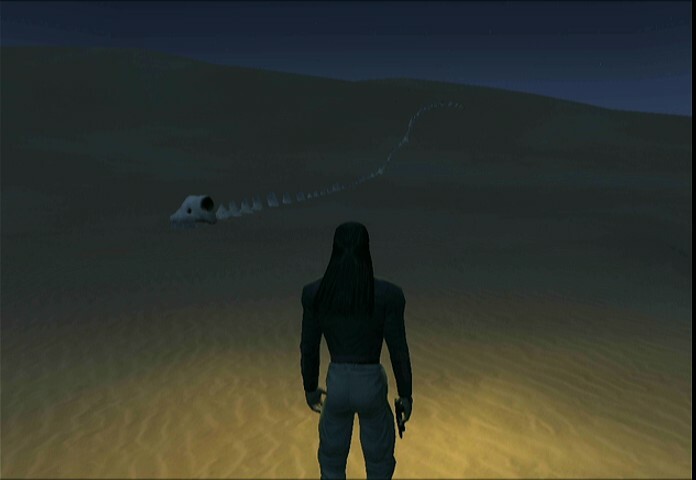 During my first days of beta, I came upon this krayt dragon skeleton; something I remember from the original Star Wars movie. In the movie, the skeletal remains of this large beast left us all wondering what it could be. That it was placed here in SWG told me that I really was about to embark on a journey into the Star Wars universe. Suddenly, I felt empowered and yet insignificant at the same time. The galaxy was really here on my computer and I was permitted to run around in it. 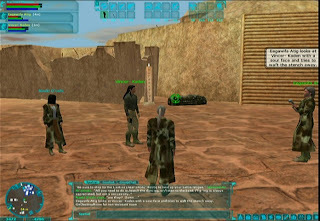 SWG Memory Lane - Daily? So SWG is ending. And I find myself caring about it. It may have strayed from my expectations, but in the early days, it was my second home for me, my wife, and the friends we had and made. Now, the days of the game are numbered. I decided to count them down while strolling memory lane. The goal is to upload one SWG image per day until December 15, 2011 - the ultimate day. I won't be able to keep up with that rate, but I'll be as regular as I can be. (No Fiber for Bloggers, I suppose?) I'll start off with some beta imagery. Quick Note: Many of my pics were lost during a computer crash. I salvaged a few off of my iPod, but unfortunately they were only low quality from there. But it's not about quality, it's memory. The beta server I started on was the only one available. A place called Bria. I was excited to begin, but I still had no idea what lay in store. The first pic I took was me - Vincer Kaden - checking out a parked speeder on Tatooine. At the time, I didn't know there weren't any vehicles yet, and was looking at the detail that was being put into this idle speeder. Not much to see, but it was the first cap then, so it's the first cap now. I promise that the next few days will also have poor quality images that seem to show nothing worth your time. But they'll continue whether you choose to come back or not. This is for me and SWG now. You're welcome to come along. EDIT: The pic above wasn't actually the first beta pic. Minutes after posting this entry, I found the honest-to-gosh first pic. It's one of a particularly wretched hive of scum and villainy. I couldn't resist taking the picture as I came upon the city for the first time.